Limited hours in the evening due to the Paleo Potluck tonight at 6pm in Venice to discuss the details of the Everything is Everything Nutrition Challenge, followed immediately by our first Barbell Club Lifting Meet! Good food, good times. See you tonight! Many of you are probably debating whether or not to sign up for the Nutrition Challenge and at the same time thinking, dreaming, and envisioning the change you would like to achieve in the next six weeks. You may be analyzing your current lifestyle choices (exercise, sleep, hydration, nutrition, stress) and already thinking about the tweaks you would need to make (and hopefully like to make) in order to produce substantial change and have a shot at winning! I can tell you right now from personal experience and from multiple accounts on this blog, that if you are on the fence about committing to a healthier lifestyle, one of the best motivators is to sign up and train for an actual event. Yesterday’s post was a great example of how a Crossfit competition can give you a push in the right direction and hold you accountable to high standards in your training. In the gym if you happen to short a rep you are accountable only to yourself and can decide whether or not to count the rep. More often than not, while you’re fatigued mentally and physically, you decide to count it and move on. However, in a competition you are accountable to objective standards and a judge, and if you get a no rep you have to accept it and do it again. The physical tests for the Nutrition Challenge do the same thing: we have put high standards into simple movements like the Push-up and Pull-up to keep you accountable with your movement patterns and paint an accurate picture of your fitness. By doing so we are testing and developing the foundational strength that will carry over into all other pressing and pulling movements, and set you on the path of long term success. Besides high standards in training, signing up for an actual event is also one of the best motivators to make healthier lifestyle choices. Every day we make a series of choices based on our priorities, and all those choices form into various habits that combine into our overall lifestyle. By this reasoning, if you want to make better choices, you must first shift your priorities. Most people define the ability to make the right choice as “will power”, but I believe that will power will always fail if your goals are not in line with your priorities. Let me give you a personal example. For the past two years, I set my eyes on the LA Marathon and began training without actually signing up for the race. Even though I said I was training, I always knew in the back of my mind that I could back out of the race and there would be no consequence whatsoever. And because there was no consequence, my “will power” failed me time and time again. I would miss my Saturday morning long run for multiple reasons: it was cold outside, it was warm in my bed, I went out the night before, I was tired and needed sleep, etc., etc. And even if I did go out and train, maybe I would run 10 miles instead of 15…you get the picture. For the past two years the marathon arrived, and I accepted the fact that I was not ready and didn’t run. Fast forward to this past December. I was headed on the exact same path. I was training for the marathon but still hadn’t signed up, and was once again doing mediocre training. This time, however, my brother signed me up for my Christmas present and in a split second everything changed and the marathon became real. I actually cursed at him when he told me, because I knew there was no turning back and no excuses this time around. Now there was a real consequence if I undertrained, and I was forced to immediately adjust my priorities over the coming months. Now when I am presented with a choice the decision is always easy: will this help me in the marathon, yes or no. Here are some of the new habits I have formed and choices I’ve made since signing up for the race that I did not do the two years prior: going to bed early on Friday night, never missing a Saturday morning long run, taking recovery protein immediately after every workout, buying a new pair of running shoes, taking Epsom salt baths after every run workout, barefoot runs on the beach to strengthen my feet, re-evaluating and measuring my water intake, testing different fuel sources during my weekend long runs, doubling my fish oil and taking it every day, and giving stretching and sleep more priority in my recovery. It is night and day when compared to last two years. 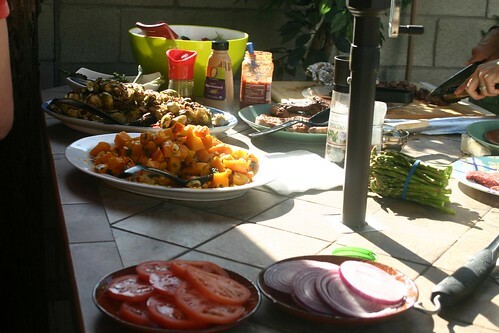 I hope to see you all tonight at the Paleo Potluck to eat some good quality food and discuss the Challenge. Think about the changes you would like to make and the choices necessary to reach your goals. Align your priorities with your goals, create consequences for your actions, and you will set yourself up for success. Our desire is to create permanent changes in your health that extend far beyond this Challenge, and that starts with the small daily changes over the next six weeks. Good luck!